A pentagram is a five pointed star as shown below. 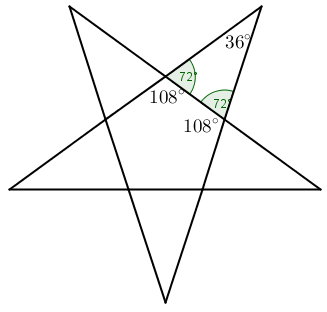 In this post, we are going to learn two proofs that the angle sum of a pentagram is equal to 180 degrees. In the discussion below, we will refer to the angles at the 5 angles at the tip of the pentagram. 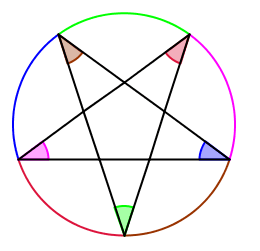 If we inscribed the pentagram in a circle, then each of the 5 angles at the vertices is an inscribed angle. Each of the inscribed angles intercepts an arc as shown by the colors in the figure below. The “red angle” intercepts the red arc. Now, notice that the five angles intercept 5 arcs which when combined is the circle. Since the measure of the all the arcs of the circle is 360 degrees, by the inscribed angle theorem, the total angles is half of that which is 180 degrees. Therefore, the angle sum of the interior angles of a pentagram is 180. The segments connecting the tips of the pentagram form a pentagon. Now, the sum of the interior angle of a pentagon is 540 degrees. Since the pentagon is regular, each of the interior angles is 108 degrees. As shown in the figure, the angles adjacent to the interior of the polygons measure 72 degrees. Therefore, the measure of the interior angle is equal to 36 degrees. Since there 5 angles, the angle sum of the five interior angles, r the angle sum of a pentagram is 180 degrees.